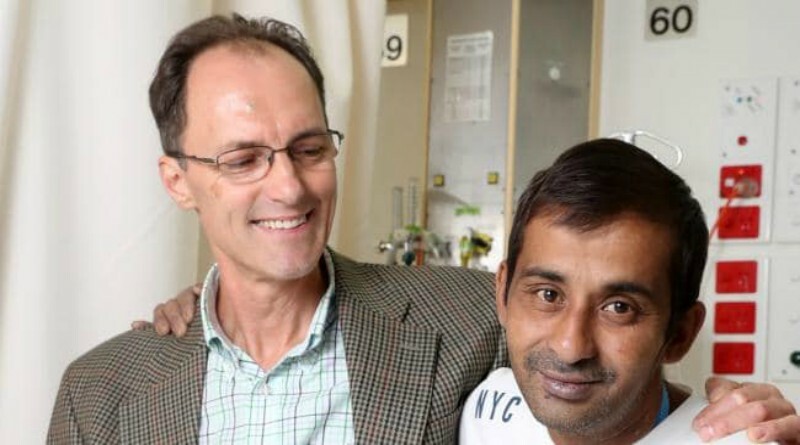 Orthopaedic surgeon, Dr Matthias Axt, from The Children’s Hospital at Westmead, is reunited with Bimal Deo. Picture: David Swift for the Hills Shire Times. Bimal Deo, who suffered a heart attack behind the wheel at Baulkham Hills, is counting his blessings after he was brought back from the dead by a hero doctor. Dr Matthias Axt, an orthopaedic surgeon at The Children’s Hospital at Westmead, said he was cycling to work when he stopped to help. He performed life-saving medical treatment which kick-started his heart. “I’m very happy that I have contributed to this person’s survival,” Dr Axt said. Mr Bimal, from Fiji, was reunited with Dr Axt at Westmead Hospital earlier this week, where he was being treated. Mr Bimal’s sister, Shiu Kumari, praised Dr Axt for saving her brother’s life. “I would like to thank Westmead Hospital and the doctors and nurses for looking after my brother,” Ms Kumari said. Read more on the Hills Shire Times website.